Plasmas are the most common form of matter in the visible universe but remain one of the least studied topics in the undergraduate physics curriculum. 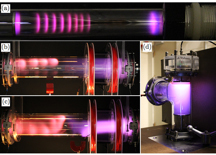 While a fascinating multi-variable system on its own, the study of plasmas also has connections to a significant number of topics in an undergraduate physics curriculum, from classical mechanics to atomic physics. In this Immersion, participants will first build a DC glow discharge, a simple plasma source that is understandable to undergraduate students yet flexible enough to be used in a variety of experiments (see our recent article in the Sept. 2013 edition of AJP for more details). This type of source is relevant to fluorescent lighting, plasma televisions, and surface treatment of materials. The dc glow discharge is composed of two conductors separated by some distance and electrical potential inside an evacuated vessel at moderately low pressures (between a few and a hundred Pascals). The electrical potential needs to be high enough (hundreds to thousands of Volts) to breakdown the gas into a plasma. The characteristics of the plasma are controlled by four variables: potential difference and distance between the electrodes as well as the type of gas used and its pressure. In our device, we evacuate glass vessels that house stainless steel electrodes. Each has a two-stage direct-drive vacuum pump, an inlet valve system, and a pressure sensor. The vessels can be filled with any gas (including air) through one fine and one coarse valve. These valves also enable fine control of the gas pressure from 3 to 300 Pa. We use power supplies that provide a potential difference of up to 2000 V and 20 mA. Plasma probe studies allow students to investigate properties of the dc glow plasma such as the electron density, electron and ion temperatures, and potentials inherent in the plasma. Such studies offer students a unique opportunity to see how the large mass difference between electrons and ions affects particle mobility and to gain an understanding of how the electric potential differs in a dc glow discharge from a parallel-plate capacitor. A probe is any conductor inserted into a plasma that collects current. The properties of a plasma can be determined from the measurements of the current on the probe as a function of the bias potential applied to the probe. Such probes directly detect electron and ion flows in the plasma and, at the same time, disturb their surroundings. Any conductive material can act as a plasma probe (wire, foil, walls of the chamber, etc. ); however, careful control of the size, shape, and material of the probe is required to obtain discernible plasma quantities. Probe tips are typically made from refractory metals, such as tungsten, and are housed in robust ceramics such as boron nitride. Probe shapes can be cylindrical, spherical, and planar, and the number of probe tips within a single device vary from one to four. This Immersion will be 3 days long. Over the first two days, we will cover the basics physics behind the plasma source, vacuum techniques, calibration of the diagnostics, data acquisition and analysis, as well as all safety aspects of the device. During this time, participants will assemble a working dc discharge plasma from the ground up and then determine various parameters of this plasma including the electron temperature and plasma potential using a simple yet robust single probe and circuit that they will construct from the provided raw materials. The third day will provide participants the opportunity to focus on a problem of specific interest and/or to connect with one of the other concurrent ALPhA immersions at PPPL. We have several versions of this plasma source, the simplest costs only $2K, the largest approximately $10K which assumes that participants do not have any equipment available for use at their home laboratory. A full parts list will be available so that participants can easily recreate the laboratory setup at their home institution. The parts for the probe and simple circuit are a few hundred dollars. More elaborate electronics can automate the measurements but cost up to $5,000.